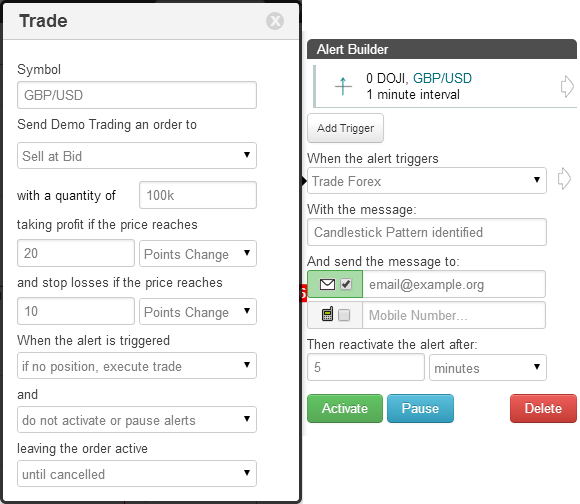 On the TimeToTrade charts, a Price Oscillator indicator can then be used to execute trades, provide an Email or SMS text message notification when your candlestick chart patterns have been met or backtest a trading strategy. The Price Oscillator is the difference between two simple moving averages (one shorter period and one longer period). The indicator fluctuates around zero, with increasing values indicating the price is rising and decreasing values indicating the price is falling. The Price Oscillator rising above zero indicates that the market is in an upward trend, as the short term moving average has risen above the longer term moving average and is interpreted as a buy signal. Conversely, falling below zero indicates the market is in a downward trend, as the shorter term moving average has fallen below the longer term moving average, which is interpreted as a sell signal. Another method used is to look for divergences between price movement and the indicator. For example, where price makes a new high but the Price Oscillator fails to do similar, this indicates momentum may be decreasing and recent prices increases are not sustainable, signalling a sell opportunity. On the other hand, where a market’s price makes new lows but the Price Oscillator fails to do similar, this implies momentum is increasing and that the down trend may be coming to an end. If the Percentage Price Oscillator is over sold or overbought, then a change of direction can signal a change of trend. 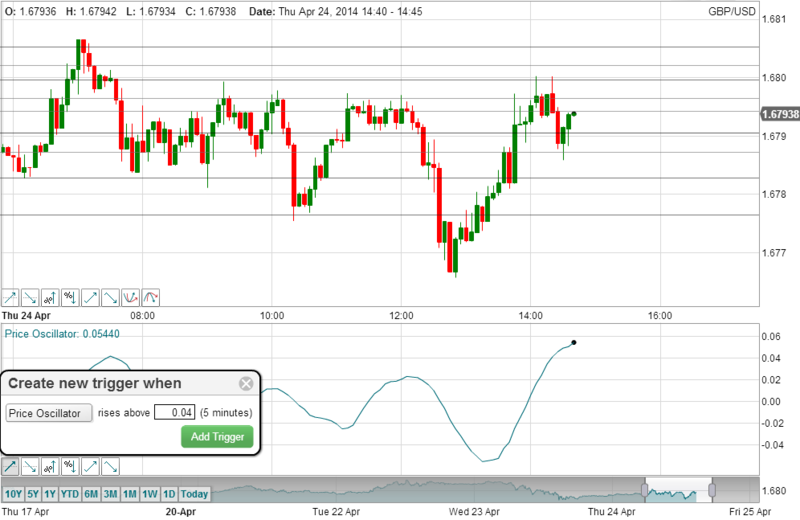 Learn more about the Price Oscillator indicator. Rising Threshold Alert Trigger, is triggered when the value of the Price Oscillator rises above a specified value. Falling Threshold Alert Trigger, is triggered when the value of the Price Oscillator falls below a specified value. Break-Out Alert Trigger, is triggered when the Price Oscillator increases by a specified value within a the selected interval period. Pull-Back Alert Trigger, is triggered when the Price Oscillator decreases by a specified value within a the selected interval period. 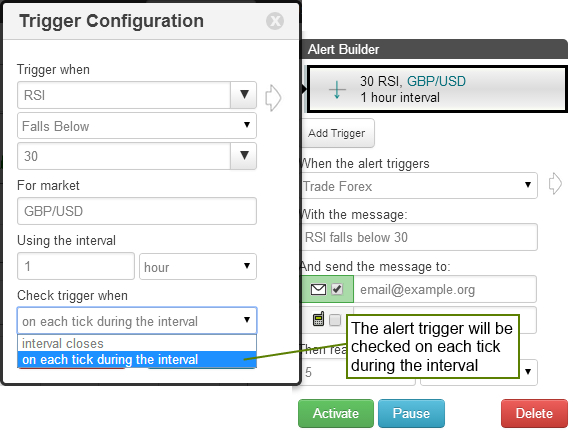 Percentage Break-out Alert Trigger, is triggered when the Price Oscillator increases by a specified value within a the selected interval period. Percentage Pull-back Alert Trigger, is triggered when the Price Oscillator decreases by a specified percentage within a the selected interval period. 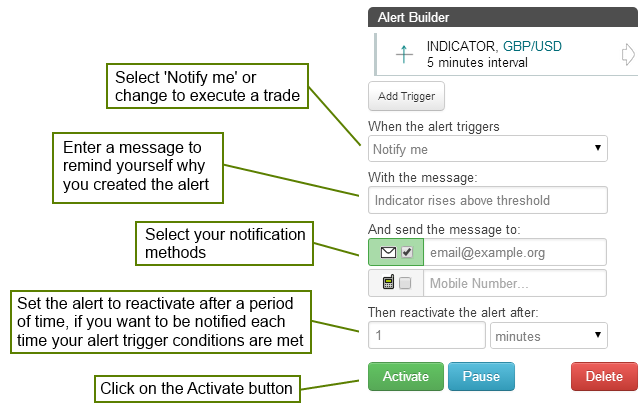 Above Alert Trigger, is triggered when the Price Oscillator is above a specified value. 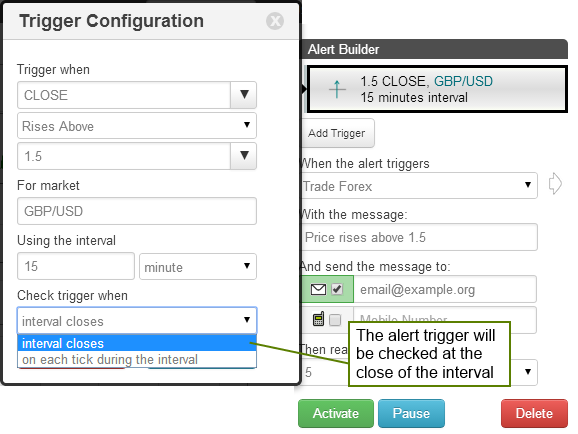 Below Alert Trigger, is triggered when the Price Oscillator is below a specified value. Positive Crossover Alert Trigger, is triggered when the Price Oscillator rises above / crosses over another indicator, price, a specified value or trend line that you have drawn on the chart. Negative Crossover Alert Trigger, is triggered when the Price Oscillator falls below / crosses under another indicator, price, a specified value or trend line that you have drawn on the chart.